•	How many bridesmaids and groomsmen will there be? •	Who outside the bridal party will receive flowers to wear? •	Will the florist decorate the pew ends or the altar in the church? •	Will flowers be required for the wedding cake? •	Will the florist decorate the reception site, including the head table and other tables? The cost of wedding flowers can vary widely depending on several factors. Exotic out-of-season flowers will, of course, cost far more than locally grown and easily obtained in-season flowers. Upscale, cutting-edge floral designers will most likely be more expensive than a more traditional florist. Bouquets rich in certain flowers and light on greenery will certainly make a dent in your pocketbook. The convenience of having a florist decorate the church and reception site can come with a high price tag. In this area, the average cost of wedding flowers lies somewhere in the $1,600 to $2,100 range for most weddings. Some brides avoid some of this cost by arranging the flowers themselves, but this can be a stressful and tricky operation. If considering this option, remember that the flowers will have to be prepared either the day before or the day of the wedding and will need to be refrigerated. Someone will have to transport them to and distribute them at the church. Is the added responsibility worth the money saved? Only the bride herself can answer that question. Color saturation is the watchword for today's bridal bouquets, according to local florists. They say that blue is still a very trendy color for flowers, especially when paired with purple or a periwinkle color. Subdued colors such as taupe tinged with pink are edging their way into bouquets everywhere, too. These colors go well with the taupe and pewter dresses worn by today's bridesmaids. As for bouquet shapes, they say that 'simple elegance' are the first words out of every bride's mouth. Many brides today seek out a pavé arrangement, which is a tight cluster of blossoms. Such bouquets might consist of a single type of flower in the same or related colors or it might include several different varieties of flowers. These arrangements have very few, if any, greens, which can make them costly. This is a very balanced, geometric look made popular by Martha Stewart. On the opposite end of the spectrum, the European hand-tied bouquet retains its favor with brides everywhere. This arrangement has a fresh, natural appeal and can include a diverse selection of flowers. Most often, these bouquets have a casual simplicity that many brides find particularly appealing. What flowers do brides choose to include in their bouquets? Romantic roses, as always, top the list. Brides also choose fresh lavender, sages and other herbs. Berries, Lisianthus (also known as the false rose) and hydrangeas make regular appearances, too. (See the chart at the end of this article for other wedding favorites). Silk flowers remain popular, especially top-of-the-line silks, that can hardly be differentiated from fresh. Some brides even include delicate silk fruits in their bouquets. To set off the simple look of today's flower arrangements, whether formal or natural, florists employ different styles of rich-looking ribbon. Satin ribbon might wrap around a bouquet's stems to hide them and to ensure unstained, unpricked hands. Wide satin ribbon in silk gives a lush simplicity when tied in a simple bow. Sheer ribbons add a fairy-tale feel to a tight cluster of elegant blooms. Ribbon colors range from deep cocoas to pearly white. Today's boutonniéres also have a new look, pared down and simple, often with a satin ribbon to accompany them. And like the pavé bouquets, boutonniéres often forego the greenery to achieve a single-minded elegance. That elegant simplicity has changed the way churches are decorated for weddings, too. "A lot of brides are doing more at the reception than they used to," a local florist explains. "The church look is simpler - the (decorating) money is spent at the reception." That means receptions have blossomed. There, topiaries and wheat sheaves decorate tables with elegance. Again, pavé clusters of single or several flowers adorn tables like jewels. Lighting is often kept soft with candles on every table. Many brides choose to leave small gifts beside each plate, such as candies wrapped in netting and ribbon, which also serve as decorations. 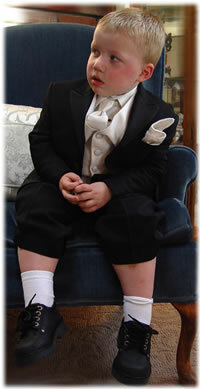 Ring Bearer, Flower Girls, Junior Bridesmaids, Miniature Brides, etc. Don't forget the little guys and gals! They are little but make a big difference in your wedding. When considering flowers for the tykes, keep safety in mind. Try to get matching flowers that are not toxic to children. Silk or plastic flowers that look real just may do the trick. Ask your local florist if they have clip-on type boutonniéres for the boys and sturdy arrangements for the girls. Be sure to check with your florist to find out what is in season at the time of your wedding and what is at a reasonable price to keep your floral costs within budget. You may also want to consider visiting your local flower mart or farmer’s market to purchase your own flowers if you feel that you can create either all the arrangements or a few (such as pew bows or center pieces). If you choose to have fresh cut flowers on your cake, it would be a good idea to choose the blooms from a market as opposed to purchasing them with your floral package, this too will help keep costs down. Acacia, Amaryllis, Anemone, Apple Blossom, Aster, Variety, Talisman of love, Bachelor Button, Begonia, Bells of Ireland, Bittersweet, Bluebell, Calla Lily, Camellia, Candytuft, Carnation, Chrysanthemum, Crocus, Cyclamen, Daffodil, Daisy, Dandelion, Fern, Flowering Almond, Forget-Me-Not, Foxglove, Fuchsia, Gardenia, Gladiolus, Globe Amaranth, Heather, Heliotrope, Hibiscus, Holly, Honeysuckle, Hyacinth, Hydrangea, Iris, Ivy, Japonica, Jasmine, Jonquil, Larkspur, Lavender, Lemon Blossom, Lilac, Lily, Lily of the Valley, Maidenhair, Magnolia, Mimosa, Monkshood, Moss, Myrtle, Narcissus, Orange Blossom, Orchid, Pansy, Peach Blossom, Peony, Petunia, Phlox , Poppy, Pot-marigold, Primrose, Rose, Rosebud, Rosemary, Smilax, Snapdragon, Snowdrop, Spider, Stephanotis, Stock, Sweet Pea, Sweet William, Tuberose, Tulip, Verbena, Veronica, Violet, Wood Hyacinth, Zinnia. Every bride dreams of the perfect wedding and spends months, sometimes years planning, all for that one special day a day she will remember and cherish for her entire life. Traditionally there have only been a few ways to preserve those memories so your children and grandchildren could experience that cherished moment in your life. Recently a new industry has emerged making it possible to preserve a part of your wedding for a lifetime. This service until recently has been reserved for an elite few with prices well above $400.00 for a single wedding bouquet. As the popularity of this service increased over the years, larger companies have entered the floral freeze drying market and brought the price down. Now a bride can afford to have here memories preserved with prices around $99.00 for an 11x14 , most brides can’t afford not to take advantage of this service. If you will be preserving your bouquet it is important to mist the bouquet with a little water and place it in a plastic bag that has air blown into it soon after the ceremony/reception. Make sure it is kept tightly closed (use a twist tie) and then refrigerate it until you are ready to take it to the preserver, or ship it. Do not place it in a freezer, as this will damage if not possibly destroy the bouquet. If shipping the bouquet, keep it chilled as long as possible. One idea would be to pack the plastic bag with bouquet in it, into a styrofoam cooler (chilli bin) with some refreezable ice packs. Secure the ice packs with tape so that there is no chance of them moving and squashing the bouquet. Stuff the cooler with newspaper or tissue around the bouquet, but do not place any on top. Be sure to use express shipping. Label the package clearly showing "THIS WAY UP" & "FRAGILE", the last thing you need after all your effort is for the carrier to damage your package with bad handling.